Water is life. Every human being requires a specific amount of drinking water on a daily basis. However, the larger percentage of all available water is most likely to contain contaminants of different kinds. Such water requires filtration before consumption in order to rid it of any harmful elements, which is why a filter like the Alexapure Pro Water Filtration system can be a must-have. How Does the Alexapure system Work ? What features does the Alexapure filter have? What do you get with it out of the box? How much time does the Alexapure Pro take to filter? Why Alexapure Pro Water Filtration System? What is the cost per gallon if you use Alexapure? Is the pH of water going to change? There are numerous models of filtration systems available in the market. These systems work in various ways and to different levels of efficiency. Mostly, some of these systems end up not fulfilling the users’ expectations, and might even expose the users to water-borne ailments. However, the Alexapure Pro Water Filtration System beats them all in the water filtration arena. This groundbreaking water filtration system is mainly designed to provide you and your household with contaminant free water. In this review, we have taken an in-depth look at the features that make this product the best water filtration system available in the market. The Alexapure water filtration system is designed to remove up to 99.9% of all water impurities. The high-efficiency level is achieved through combining the filtration power of a composite shell of ceramic with the superior filtration capabilities of an all new gravity block core. The ceramic shell is coated with silver, which makes it a powerful antibacterial agent. The ceramic shell is the outer shell, which blocks large molecules and contaminants. Once it passes through the outer shell, the inner shell is a carbon(composite) filter which removes organic contaminants and many pathogens. Alexapure Filters are what are known as gravity filters, which use the force of gravity to pull water from the top chamber in to the bottom chamber through the filter block above. Although there is just one filter block built in, you can use multiple filter blocks to speed up the process. Once the water has filtered into the bottom chamber, you can simply use the spigot to dispense water. The filtration system can be used in places with and without a power connection since it does not require electricity to operate. The Alexapure water filtration system is laden with great features to ensure you get a constant supply of pure, healthy drinking water. You can use any kind of fresh water with this filter and it will clean it up. The only water you should not use is salt water, which will screw up the filter. It has a filter capacity of 5,000 gallons. Such a large reserve of water ensures that you will never run short of clean drinking water. The filtration system boasts a stainless steel construction that is both hygienic and durable. Ease of assembly and low maintenance. There is nothing worse than a water filtration system that you cannot disassemble easily for cleaning and reassemble. The system is powered by gravity and will not incur any electricity costs. The filter has an extended lifespan thus eliminating the need for constant replacement. It has a spigot that provides instant access to purified fresh water for drinking. In addition to these amazing features, this water filtration system greatly saves on space. Alexapure gravity block filter with a hybrid shell of ceramic. It comprises the major filtration components of the system. There is a rubber base ring to provide a nonslip anchor for the system. One stainless steel upper chamber. A lower chamber, also made of stainless steel. A lid made of stainless steel. There is also the spigot assembly. The knob assembly and rubber plugs are also included in the box, together with manual bearing instructions for assembly. Each Alexapure Pro Water Filtration System package comes with one gravity block filter. However, the system is designed such that it has the capacity for four filters. You can be able to increase the pure water flow rate without compromising the quality of your drinking water. The Alexapure water filtration system is one of the easiest to maintain. It is however highly recommended that special care and attention be given as follows when needed. You can check test results here. Since we’re relying on gravity, water is constantly pushed down through the filters. The Alexapure has a rated capacity of 1 gallon per hour. For drinking purposes, this is more than suitable even for a decent sized family. The more water there is the more the force of gravity is acting, so it will filter faster. So to keep it working at full speed, you’ll want to keep the upper chamber as full as possible. Since the chambers are made of stainless steel, they are by default easy to clean. However, you will need to thoroughly rinse the interiors with cool, fresh water before first use. The same is recommended every time you disassemble the system. The exteriors should be regularly wiped clean with a soft, clean cloth. Untreated water contains a lot of minerals. During the filtration process, some of these minerals may form a coating on the system’s ceramic shell. This layer hardly affects the water filtration process, but it needs to be occasionally cleaned. It is recommended that you carefully remove the filters from the upper chamber and clean their exteriors. The best way of cleaning the filter exteriors is by use of a scouring pad with no soap, gently scrubbing away the mineral buildup and thoroughly rinsing them in fresh water.After cleaning, replace them in the upper chamber. The Alexapure gravity block filter is designed to provide you with clean drinking water for the longest period. The filters hardly ever stop working. However, it is imperative that you once in a while change the filters to maintain a steady flow of pure drinking water. It is recommended to change your filters upon noticing a drop in the water flow rate. As we saw in the beginning, water is the single most essential commodity for life. In this regard, a steady supply of this commodity is a must have for every household. There are, however, many contaminants in water. Some of this water is supplied through pipe systems that were installed decades ago. As we all know, water contains minerals that coat and corrode these pipes over time. The water that passes through these pipes could be harmful if taken directly from the tap, hence the need for an efficient water filtration system. Again, the Alexapure water filtration system comes with a full money-back guarantee from the manufacturer. There is an initial one year warranty during which you can return the product for a full refund if you do not find it satisfactory. Another excellent benefit of having the Alexapure water filtration system is the versatility. Since this product does not require electricity to operate, this system can be used anywhere in the world. It means that it is the best water filtration system to carry on your outdoor trips, and also a great choice of system for those working in areas with scanty water supply. 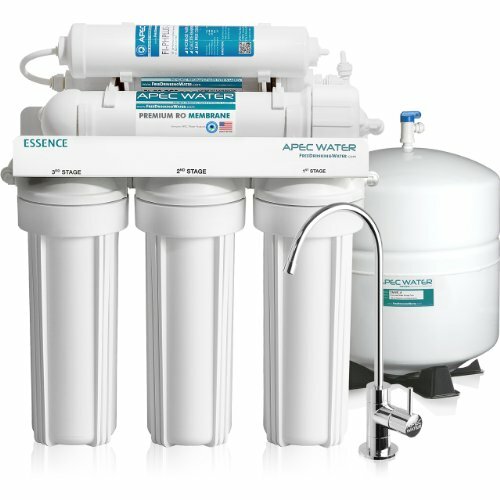 When you go shopping for the most efficient water filtration system for your household, look no further. The benefits that this system offers compared to the other models in the market are outstanding, and this review will guide you into making a wise choice. Since replacement filters cost around $90, your cost per gallon – considering that one filter lasts for 5000 gallons will be about $0.02 per gallon. However you should bear in mind that the full one gallon per hour speed will only be achieved if you have 4 filters in the cartridge instead of just the one. With just one filter, it will filter much slower. But if you’re using four filters at once the cost per gallon is still only around $0.08, which is still significantly cheaper than any grocery store. Because the Alexapure removes certain contaminants which make the water slightly acidic, you may find that filtered water is slightly more alkaline. However, there is no exact number you can really assign as far as pH is concerned – it won’t become extremely alkaline, but the degree of alkalinity will also be determined by what kind of water you put into it to start. Not all things dissolved in our drinking water are necessarily bad – minerals like calcium or magnesium can actually be good for you. So are these removed by the filter, too? These sometimes beneficial minerals remain in the water so if you have slightly hard water the hardness will not change. Your water will retain that “mineral” taste if it has it – the only taste and smell to go away is that of chemicals and contaminants. You can verify this using a TDS (total dissolved solids) meter – the reading will not change before and after filtering, indicating that the mineral content is still almost the same. If you want to completely remove minerals from your water, too, then you’ll have to use an RO system. Comparing the Alexapure filter and the Berkey filters, you’ll see that the differences are only very slight – though some of the differences can have an impact. Both Alexapure and Berkey use a carbon filter. The only difference is that the Alexapure filter contains a silver/ceramic shell, whereas the Berkey does not have this kind of shell. Black Berkeys are good for 3,000 gallons, and Alexapure Filters are good for 5,000 gallons. Alexapure filters and Berkey filters cost almost the same – though Berkey filters are generally a bit more expensive. However, you should remember that Berkey requires an extra filter for fluoride which Alexapure does not. Alexapure Pro Filtration systems are about 25% cheaper than Berkey filters. Considering that both filters are the same size and the Berkey requires an additional filter, it may be more economical to use an Alexapure rather than a Berkey. Another competitor to Alexapure in the gravity filter market is Propur. These are also very similar filters but they have slight differences. Alexapure and Propur both have carbon filters with a silver-infused ceramic outside shell. The Propur filter is GAC, or granulated activated carbon, and Alexapure’s filter is a carbon block. GAC filters contain loose granules of carbon, whereas carbon block filters contain very finely grinding carbon particles which are then compressed into a brick. Both start out with ground up particles of carbon. In GAC filters, the carbon is left in a loose granular form. Carbon block filters are made by further grinding and compressing the carbon into a solid block. As you can imagine, the tightly packed carbon particles in the block filter will filter water more effectively, but it’ll be slower and will need to be replaced a little more often than GAC filters. Propur filters must be replaced every year – Alexapure filters can last up to 5 years depending on how heavily you used them. Also, Propur filters are more expensive – you’ll get a pair for $140 while an Alexapure filter is $100 or so. However you should remember that you may need to get more than one filter in the Alexapure to speed up the process. The Alexapure is cheaper than the Propur filter, but it should be noted that the Propure filter can hold half a gallon of water more than the Alexapure can. 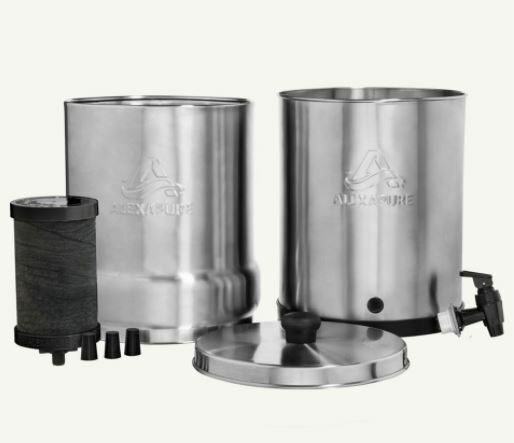 If you’re looking to drink filtered water and don’t want to depend on electricity, or if you’re a prepper and you want to be able to have clean water for yourself and your family in the event of a SHTF event, the Alexapure Filter is a good choice to have around. It won’t take up too much space on your kitchen counter and it will provide enough drinking water and fast enough for a family of 4 to 5 people very comfortably. It also does not cost too much, though there is a recurring cost with the filters. Preppers should take note of this and pick up a stockpile of filters, too! Yes, sure you can use RO water on the Alexapure. but i should not use water from our water softener? Jon. Do I need to add back minerals to my water after it’s been filtered thru the system?